The story of 14 year old Ahmed Mohamed has been floating around the intarwebs for the last couple of days. Following news that high school freshman Ahmed Mohamed brought a homemade clock which police described as a “hoax bomb” onto campus, police declined to file charges and President Obama reached and invited Mohamed to bring his clock and visit the White House. Contrast that with the experience of an unnamed elementary school student who was threatened with expulsion–and ultimately pulled from the school–for drawing a picture of a Ninja holding a gun. 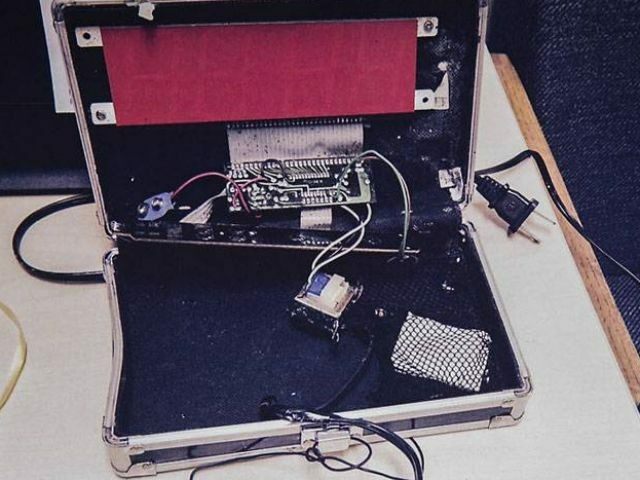 This is a commercial alarm clock that little Mohamed uncased and crudely mounted into a box. He did not design the circuit. He did not make these circuit boards. He did not solder the ribbon connector between the display and the main clock board. If you look at the left of the box you can see a blue oval that is the connector for a 9 Volt battery to keep the commercial clock running during a power outage. Mohamed did not secure the power transformer (blue and tan cube to the left of the checkered bag in the lower right corner. The ribbon connector between the display and the main board is what cinched it for me - these are assembled and soldered by machine. It is very difficult - even for me with 50+ years of soldering experience) to do as uniform and neat a job. No way is a high-school student going to be able to do this especially with the sloppy level of craftsmanship on display here. This page contains a single entry by DaveH published on September 17, 2015 12:34 PM. Alinsky simplified was the previous entry in this blog. Carlos Danger out of work again is the next entry in this blog.